I Love Milgard Windows and Doors! We adore the sculptured grids and some beautiful Anodized Bronze finish on interior and exterior with sculptured or flat grids. The color blends so well with the black and grey color scheme that are so "in" right now and the energy conservation that these windows offer really is superior to most other options on the market. Milgard also offers a much thinner profile than the norm- which is a beautiful look for any elevation. Love our Tuscany Series Windows! I like the Essence Series because I love the look of wood windows. I love the Tuscany series windows and sliding glass doors. 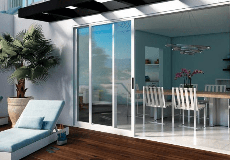 I like the look and functionality of the Ultra series swing out patio door. I have covered deck and the would work well for me.